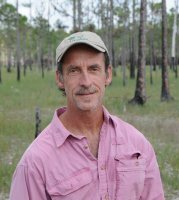 Reed Noss is Provost's Distinguished Research Professor at the University of Central Florida and President of the Florida Institute for Conservation Science. He has served as Editor-in-Chief of Conservation Biology and President of the Society for Conservation Biology. He currently conducts research on vulnerability of species and ecosystems to sea-level rise; climate adaptation strategies; road ecology; and changes in ecological processes and species assemblages along urban-rural-wildland gradients. His latest book, Forgotten Grasslands of the South, will be published by Island Press in fall 2012. I write primarily to get my impressions and thoughts out on paper, so that they do not drive me crazy inside my head, and to force myself to learn a subject as thoroughly as I can. I also write to share my experiences and to help increase awareness about places, subjects, ecosystems, species, and people that I think are especially wonderful.